MMXVIII – fashion, labels, advertisement, and connectivity - access all areas. When it comes to the creation of couture these days, there is hardly anything that cannot be gained access to in nearly real time. Rewind to the end of the 18th century and fashion plates were the only medium to convey what the latest styles would look like. 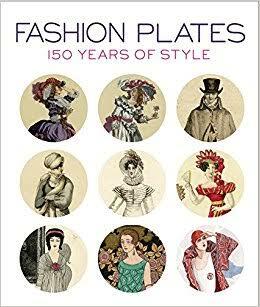 Fashion Plate: 150 Year of Style is an opulently illustrated mélange of two-hundred depictions of what the the fashionistas of the respective eras from 1778 to the early 1900s not only feasted their eyes on but helped them to decide what to purchase. No matter if it is French dresses from the early eighteenth century, Art Deco from the early twentieth century or male and female haute couture in between, the book presents a diary-like chronic of the fashion world before photographic evidence became commonplace. The quality of the depictions is superb, with the plates having been meticulously reproduced on quality paper, which makes it a visually appealing addition to one’s coffee table book collection. The accompanying elaborations and essays by fashion historian April Calahan give additional insights and contextualize them in a meaningful and enlightening manner, which should offer something new to discover for both the uninitiated as well as subject matter experts. The fashion plates illustrated come from the Gladys Marcus library at the Fashion Institute of New York, with some of them never having been reproduced before. A great overview of how fashion has evolved but also deteriorated over the centuries that offers plenty of eye candy and is substantiated by a foundation of solid research.